Week 3 of the 2017 Youth Tackle League at Chippewa High school on Saturday the 30th. Please remember to dress warmly this week. Bring chairs as there are no benches or bleachers. Be sure your player brings lots of water. Even though it will be cooler, they still need to keep hydrated and there is nowhere to fill up. Also, there are no washrooms at the field unless there is something going on at the school. Please kind to all the players, cheer for great plays! Don’t be hard on the refs, reffing is not an easy job! Banquet- Please remember the player gets a ticket to the Banquet on October 29th. Each player can purchase 2 tickets at $18 each between now and the end of the October 3rdgame. On October the remainder of tickets will be sold on a first come first serve basis. So you can bring cash to the game tomorrow or Tuesday or do an email transfer to me at this email to reserve your tickets. We can not hold tickets until they are paid for. Please see Darlene a mid filed at the games. Swag Draw- We have two more swag bags up for grabs this week, that include bulldogs cinch bag, tshirt, and hat, $20 gift card for sport cuts and either a Dallas cowboys short sleeve Nike shirt or Buffalo Bills long sleeve shirt! Tickets are $2 each, 3 for $5 or 10 for $10. Please remember all proceeds go back to the team, to purchase equipment for the players. Be sure to bring some cash! Last weeks winners can pick up their prizes at midfield! Pepperettes- Sorry I forgot to bring pepperettes last week, but I will have them tomorrow. They come in bags of 15 and sell for $2 each so $30 per bag. If you would like to grab a bag or two to sell, see midfield and we will take your name and give you some to sell. Warning they are really good! They are great for lunches and snacks as they do not require refrigeration. Great for the upcoming hunting season! If you haven’t already joined the facebook page you should! 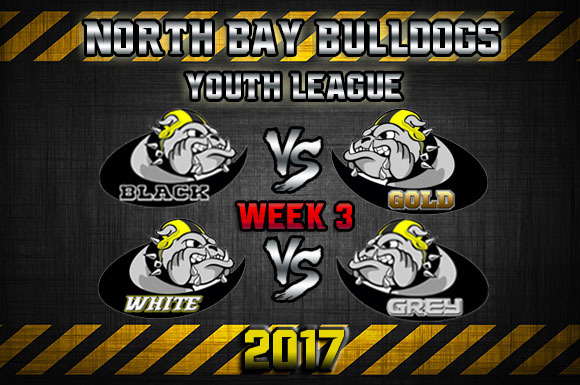 North Bay Bulldogs Youth tackle football. We have a contest going on that you can share your photos with everyone to enjoy!